David Landau had the most liked content! Lighting for film/TV/video/theater, which I've been doing professionally since 1979. 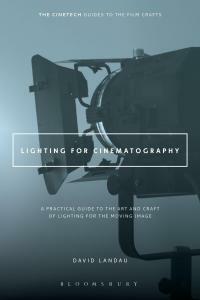 I now teach lighting at Fairleigh Dickinson University and just wrote a book on the art, craft and practice of lighting for cinematography. I am also an IATSE Local 52 gaffer and an LD & cinematographer for corporate videos and indie features on limited budgets. I started in this biz doing tabletop and products. A lot of how you light it will depend on how much of that room you want to see round the speakers. In general, products are lit with top softlights, from either directly overhead or slightly behind the product. The iphone you pictured is lit with softlight and probably a large silk so that there are reflections of white. It all depends on the style/look you are going for. The pictures you included were sleek and smooth items - but a speaker isn't really a sleek item. Its loud and brash. So you have to decide do you want to light it like a car commercial or like a rock concert? that's a discussion between you and the client. But if you go for the rock concert, that's hard colored light. You could use PAR cans and just side wash the columns in red and blue. You could add a glow to up light the wall in the back with a floor light - possible a keno with gel on it like the car still you included. The product itself has a griddy front look that might play well with hard light shining into it on an angle, casting shades. I would still top light it with a softbox and front light it with a soft source, but definitely hard backlight that is bright. For the slider shot to rad even better, you should have light on the background so you an see it move. Just some suggestions. Good luck. Another option is what we do on Project Runway - balance your camera to 4300k, then put 1/4 or 1/2 minus green inside the overhead fluorescents. Sometimes we add 1/2 blue as well, depending on the listed color temp of the lamps in the over heads. Then we add direction with kinoflos with mixed tungsten and daylight lamps. This way we use the ambiance of the daylight mixing with the overheads but add directionality with the kinos. Another option is to just turn off whatever lights are there and bounce your own light into the ceiling to provide the same look and feel of the overheads. On Runway Allstars I've done this a few times, using a 575 or 1200 HMI par into the ceiling. Then use the kinos with all daylight lamps. Camera then can be balanced for 5600k and the window will look the same color. One thing we also want to do is let the windows blow out some. If the outside is the same as the inside it reads too fake. Everyone has ground up with their own cameras and phones that overexpose the window when taking pictures inside. We want to keep that so that it looks "real". Good luck. You might want to look at the products from the rag place - http://www.theragplace.com/ They make a wide range of materials and can customize the size. I shot a short in a church during the day - low budget and a number of educational videos for a liturgy press company, also low budget. We used source four ERS lights with glass break up gobos and a stained class pattern gobo. This way you can use the source four as a key light to hit the alter and it will fit in with the stained glass window look. Daylight 4x4 Kino flos or daylight LED lights can be used for front fill and eye light on the close-ups and medium shots of the bride and groom. Use the source fours as 3/4 backlights. You seem to have a balcony. If you are lucky enough to get 4k HMIs, my suggestion is to put them up there and shine them down as back light, edging the crowd in te pews. As David said, the light from outside is really you key light for your wide shots and as your ambient light. Have fun with it and make it high key - low contrast. Sorry I didn't see this post earlier, I would have said to add kickers, backlights and background lighting. If this is a commericial, everyone needs to look really good and happy. adding slight kicks on the women's faces and a nice not over bearing backlight makes things look happier. Lighting your background adds dept and separation from the subjects. Product shots are traditionally done with a soft overhead light and double backlight rims, then an inkie with a snoot on it to add a subtle highlight to the product label. Hope all went well. Spot meters are reflected meters for getting readings far away. If you're shooting with a 250mm lens, instead of sending an AC running down to the subject, you use the spot meter on the face of the subject. The center circle is what the meter is reading, not the entire image you see. It'll give you a reading based on the subject being 18% grey. So now, depending on the subjects skin tone, you close or open up the iris. Correction - the "2k" daylight LEDs use only around 400w. The new Mole LED "5k" uses 900 watts. When shooting at night, the light coming through the window doesn't need to be a very powerful unit. As David mentioned, a lot will depend on your power source. Mole, litepanel, Desist all make "2k" Daylight LED lights, which will give you a very nice blue through the window without gel and using only around 900 watts of power. There are also the Bee Hive plasma lights which are bright and use low wattage. For the fire, you could use two inkies or 150w fresnels on the floor, one with half CTO and one with a stray color. You can run them through a flickerbox or use two hand dimmers and have someone just dim them up and down erratically - never letting either go below 50%. Balance for for 3200, unless you want the blue less saturated. But remember, in real life moonlight is around 5600k and our brains have balanced our vision to something around 2,800k. So letting the blue be blue is actually more natural. The main question is what is the emotional content of the scene? Is it frightening? Sad? Romantic? Each one would be lit sightly different, changes in the contrasts and whether you're adding kicks or backlight. Do you want the rest of the room to fall off into an unknown black oblivion or be a safe haven for the characters? Hello Vivek, There are a number of lighting units that work well inside cars for both day and night. There are the Roco lite pads which come in a variety of sizes. there are the Cineo remote phosphor Matchsticks which are very bright and narrow. These are great small units with exchangeable diffusers to change the color temp. There are the mini-kinoflos. BBS makes remote phosphor LEDs in a variety of lengths. RST makes 4ft remote phosphor tubes as well. Almost all can be either powered off your cigarette lighter outlit or via battery. You can also get a converter that plugs into the cigarette lighter and has two standard Edison outlits on it, which is something we used a lot on Project Runway for car shots. You can even to the poor man's version and buy an inexpensive "shop" fluorescent fixture, gel it with 1/2 minus green and 1/4 CTB, lie it on the laps of the subjects in the front seat, and plug it into the converter. The Stella is a new daylight, self-contained battery LED light that is very bright and small. They can be charged up and will last quite a while They are rather easy to rig into small places. They have attachments such as a fresnel front and a chinaball front. I just picked up three of these to play with and do tests with. At 10 feet at 800ISO they're reading 5.6 with the fresnel adapter. They come with snap in barndoors as well. Suction cups can easily be used with these units. For daytime whatever lighting units you use inside should be for subtlety bringing up the face, and not look like the main source. For night time it should appear to be the light from the dashboard, so it would be the primary source. Are you towing the car? I had students who did a film with a lot of car interiors and they added a two bar and towed it. That makes it easier for the actors and for the crew. Te actors don;t have to worry about safe driving and acting at the same time. You can shoot from the two vehicle, you can run sound cable from it, you can shine lights from the tow vehicle into the car, etc. They also cut and put ND gel on the back window at times, so they could shoot anytime of day. There are also one day and weekend seminars given by cinematographers, often hosted by lighting manufacturers or rental houses and some just done on their own. Here in the US there have been several that travel around giving lighting or cinematography workshops. You might want to look into that. Also, perhaps British Cinematographer magazine hosts some or advertise some? There's a documentary about Jack Cardiff and both he and Freddie Young wrote books - both major British figures in the art of cinematography. "Magic Hour" by Jack Cardiff and "The Work of the Motion Picture Cameraman" by Freddie Young. The DVD of Black Orpheus has a special feature about Jack Cardiff's wonderful lighting. Freddie Young's autobiography is "Seventy Light Years" and there's a biography of Cardiff titled "Conversations with Jack Cardiff". One of the main things about lighting for movement is lighting the end mark first, which is usually where the actors will spend most of their screen time. Also remember that we humans perceive motion by things moving in and out of light. So its good to have variations in light levels as the subjects move. One of the most important things is that the subject's motions need to be planned and nailed down. There's a great story about Gorden Willis while shooting The Godfather, that he threw a tantrum and walked off set because Coppola won't nail down the blocking of his actors in a scene. Willis was already a well established and recognized artist and Coppola was still up and coming. Willis told Coppola he had to do his job and tell the actors where to go so that he could light it. Coppola said that was one of the best lessons he learned about working on film. Sorry to be plugging my book again, but if you want to practice lighting for actor movement, I have a few exercises in my book, which got good reviews from International Cinematographer's Guild magazine and was mentioned in British Cinematographer magazine. Its only $29 so its not a major investment and it is being used in a number of film schools as its about how to get a bigger budget look with low budget gear. I wrote it based on my experiences working as a union gaffer and indie DP and on the lighting course I've been teaching for over 10 years. So its a do-it-yourself film course.​ My advice, for whatever its worth, is to set some time aside and practice lighting things with the gear you have. We all learn by doing.